This holiday season we are very excited to be doing our first Kinstra fundraiser! We are selling candles to raise money to buy Christmas presents for homeless children. You can be a part of bringing a smile to these kids' faces by purchasing a candle package below--ALL profits will go towards presents! 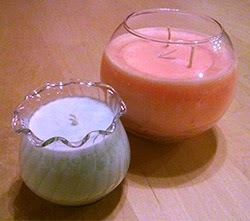 For three years now we've been making candles for gifts and special events. It's something we really enjoy doing together, and we've always hoped that someday we could use our love for candlemaking to benefit others in some way. Then in October Anna had the opportunity to work with a classroom full of homeless first graders. It was an eye-opening experience for her to see that children are homeless too, and we really wanted to do something to help these kids and others like them. We had just made a huge batch of candles for Christmas gifts, and ended up with way more than we needed. What could we do with all of these extra candles? After much discussion, the idea for Kinstra's Holiday Candle Fundraiser was born! The fundraiser runs through Friday, December 12. To keep things simple, we're just selling packages of candles that all total about 20 fluid ounces for $15. One package = one gift for a child! Using the PayPal button below, you pick which sizes and styles you'd like, and the type of fragrances you prefer, and we'll put a package together for you! What candle sizes and containers are available? We started out by upcycling baby food jars and that is still the primary type of container we use. 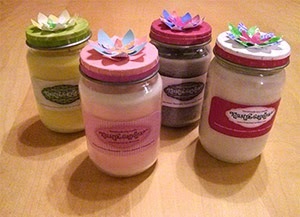 Baby food jar candles are so cute and they make great gifts! They come with decorated lids which helps their fragrance last even longer. 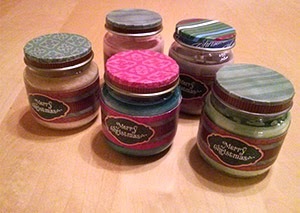 You can buy with with Merry Christmas labels so they're ready for you to give away. 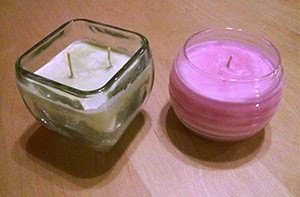 We also have some candles in other glass containers for variety in style and size. We're using PayPal so you can pay securely online with a debit or credit card. Just select your options below and click the Add to Cart button! If you're in the Phoenix area we'll deliver your candles by December 13. If you need them before that, or live outside the Phoenix area, we'll ship them to you (we'll send you a separate PayPal invoice for shipping costs). How much goes to the kids? All profits will go straight to Christmas presents for homeless kids! We will be buying gifts for the Angel Tree at the elementary school Heidi's mother-in-law worked at for many years. There is a homeless shelter near the school, and every year teachers select the students they know need help for the Angel Tree. Besides buying candle packages, it'd be awesome if you could share this on Facebook! Also if you have empty candle containers or scrapbook paper scraps that you'd like to donate, we hope to be able to do another candle fundraiser next year. The fundraiser is over so the PayPal button has been removed. Thank you to everyone who participated, and stay tuned for future fundraisers!